Canada’s TB and HIV communities are coming together to break down silos between the two responses. Our communities are building on expertise, experience and lessons learned to strengthen Canada’s response to TB and HIV. Tuberculosis (TB) is the world’s leading infectious killer, claiming 1.7 million lives every year. In Canada, TB disproportionately affects newcomer communities (who represent 70% of cases annually) and Indigenous communities (with Inuit populations specifically being nearly 300 times more likely to develop TB than the general population). 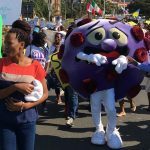 Furthermore, people living with HIV/TB co-infection are up to 24 times more likely to develop active TB than persons without HIV, and TB remains not only the most common presenting illness among people living with HIV—even when taking antiretroviral therapy—but is also the leading cause of death among people living with HIV globally. TB co-infection with HIV poses a tremendous challenge to health systems, communities and families worldwide, particularly in resource-constrained settings that can be observed in communities across Canada. Recent reports show pronounced disparities in certain population groups and geographic regions across the country, with foreign-born individuals and Indigenous peoples in particular being disproportionately affected by HIV, TB and HIV/TB co-infection. In September 2018, the United Nations (UN) held a high-level meeting on TB, a historic opportunity to ensure TB gets on the agenda of the heads of states and governments, and that we get different sectors engaged and accelerate our efforts to put the world on course to ending TB. UN Member States, including Canada, endorsed the Political Declaration on Tuberculosis that emerged from the HLM, reaffirming their commitment to end tuberculosis by 2030. 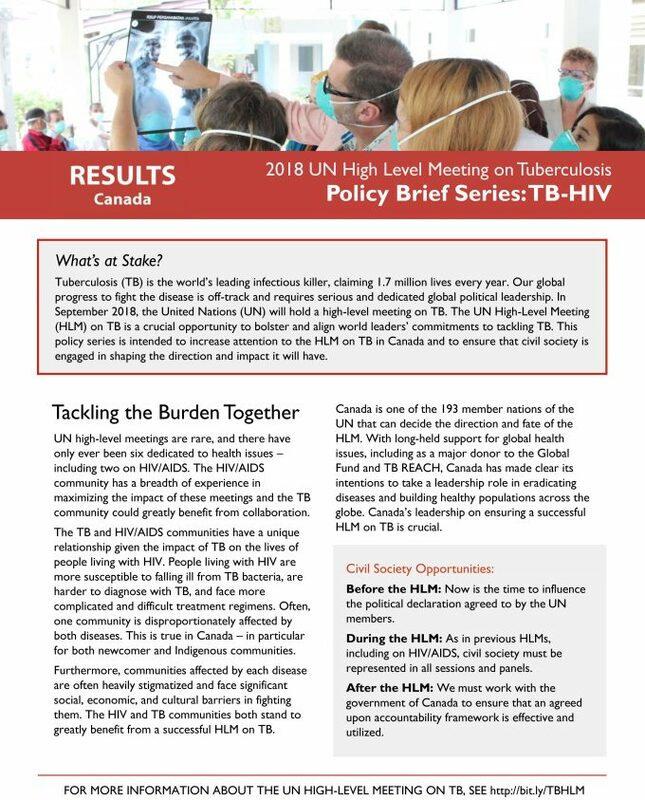 How is the 2018 HLM on TB relevant to Canadians? By endorsing the Political Declaration that emerged from the HLM, Canada made commitments to addressing TB within Canada and globally. We can hold our government accountable to these commitments, which align with previous Canadian commitments, as expressed through Canada’s Feminist International Assistance Policy, the United Nations Declaration on the Rights of Indigenous Peoples (UNDRIP), the Sustainable Development Goals (SDGs) and the 2016 Political Declaration on HIV and AIDS. They also align with the health-related Calls to Action from the Truth and Reconciliation Commission of Canada. They can support ongoing efforts by Canadian civil society and governments to address TB within Canada among Indigenous communities, newcomers, immigrants, refugees, and people living with HIV and internationally in several high-prevalence regions and key populations. ICAD, in partnership with RESULTS Canada, hosted a multi-sectoral policy dialogue in November 2018. The dialogue complemented global and national activities surrounding the 2018 HLM on TB and ensured that civil society is engaged in shaping Canada’s national and international response to commitments made at the HLM on TB. Participants and speakers included community partners, advocates, people affected by TB/HIV and policy makers. Given the context of TB in Canada, there was a strong focus on Indigenous health and the health of newcomers, immigrants and refugees. Given the global context of TB and HIV, we applied a gender and feminist lens. ICAD and RESULTS are exploring ways to make progress on the Policy and Programming Options that emerged from the Policy Dialogue. 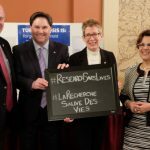 This could include forwarding them as recommendations for our governments, including the three federal government departments that were at the Policy Dialogue: Indigenous Services Canada; Public Health Agency of Canada; Department of Foreign Affairs and International Trade (Immigration and Citizenship Canada was unavailable). Factsheet: Key facts on TB-HIV in Canada, with sections providing a focus on Indigenous communities and a focus on immigrant/refugee/newcomer/foreign-born communities. Issues these communities face in relation to screening, access to treatment and services, stigma and other barriers to good health. Case study: Focussed on Indigenous responses to TB (e.g., the development of the TB Elimination Strategy in Inuit Nunungat, in partnership with ITK, focussing on the community engagement process; screening initiatives such as TAIMA (Stop) TB campaign in Iqaluit; or screening programs in Qikiqtarjuaq and Whale Cove). Key recommendations policy brief: The Policy and Programming Options that emerged from the Policy Dialogue will be adapted into more focussed work on key recomendations. Take ACTION: How Can I Get Involved?  There are a number of ways in which Canadian HIV and TB communities and advocates can get involved in both national and global activities. 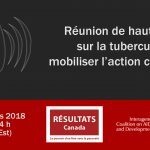 Join the Canadian TB and HIV group hosted by RESULTS Canada. 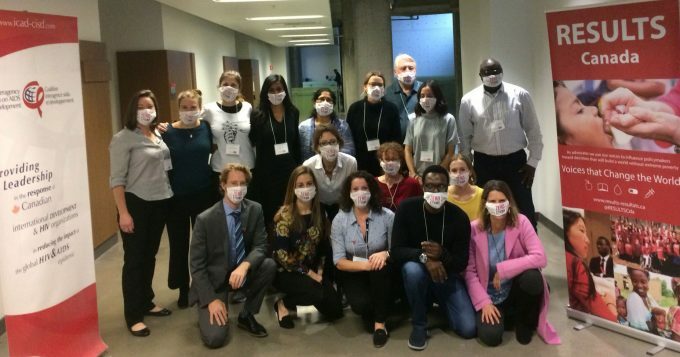 This group aims to foster dialogue, share lessons learned, expertise and experiences in an effort to strengthen Canada’s response to TB and HIV. Contact Shelley Garnham, at shelley@results-resultats.ca for more information. As the Global Fund prepares for the 2019 Replenishment, Canadian civil society met with Peter Sands, Executive Director of The Global Fund about the Global Fund’s Case for Investment, Canada’s contributions to the Global Fund, and the role of civil society and partners in getting to a fully funded Global Fund. WEBINAR RECORDING: The High-Level Meeting on TB: What happened and what’s next for Canada and the World? In September 2018, the United Nations (UN) held a high-level meeting on TB, a historic opportunity to ensure TB gets on the agenda of the heads of states and governments, and that we get different sectors engaged and accelerate our efforts to put the world on course to ending TB. UN Member States, including Canada, endorsed the Political Declaration on Tuberculosis that emerged from the HLM, reaffirming their commitment to end tuberculosis by 2030. What are the implications of this historic commitment for addressing TB in Canada? For the global community? And most importantly – for the communities most affected by TB? Why does gender matter in the fight to end the TB epidemic? How does TB affect women and maternal health? 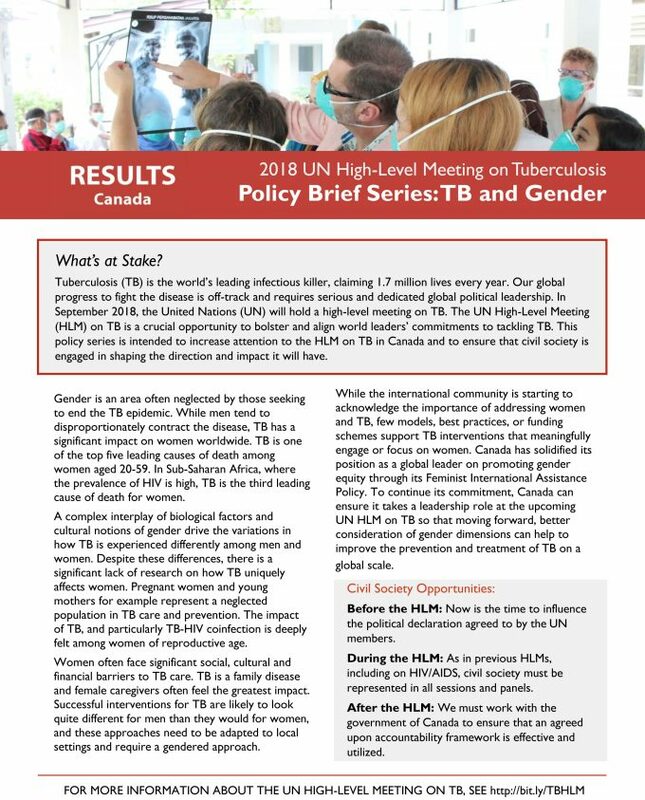 Gender is a key priority for the Canadian government, how can Canada take a leadership role in the TB response? What role does Canadian civil society have to play? cause of death for women. community could greatly benefit from collaboration. How can we end TB within a generation? A bold goal needs a bold strategy. This week, “The Lancet Commission on TB: building a tuberculosis-free world” was released. The commission provides a roadmap with five priority areas for tackling TB. Decades of neglect have allowed TB to become the world’s leading infectious killer. The tuberculosis advocacy community needs to build on their [the HIV community] expertise, experience and the lessons they learned. 26 September 2018 – The UN General Assembly unanimously adopted the political declaration on TB committing world leaders to accelerate national and collective actions, investments and innovations in fighting the preventable disease. The TB Key Asks were developed over several months of discussions and consultations with the TB community at large and most stakeholders and partners. While the Political Declaration is not as strong as hoped for, this document expresses our keen willingness as communities to support our governments to look beyond the Political Declaration and take bold steps forward in the best interest of the 10 million people around the world still falling ill with TB every single year. On Wednesday, as part of the United Nation’s annual General Assembly in New York, world leaders are convening for the first ever high-level meeting dedicated to fighting tuberculosis, and Nandita Venkatesan got the chance to share her story as a survivor in the opening session. The UN’s first High-Level Meeting on tuberculosis is a positive step – the way TB has been neglected is a scandal. The world’s top infectious killer finally got a spot on the world’s stage, but experts say more political will and accountability are needed to make a dent in fighting the disease. BY LUCICA DITIU and PETER SANDS, THE GLOBAL FUND – By any standard, the 5,000 people who die of TB every day is an unacceptable level of human suffering and economic burden. In September, heads of state have a unique opportunity to raise their game and decisively shift the trajectory of the disease with the United Nations General Assembly High-Level Meeting on TB. BY STOP TB PARTNERSHIP – Members of Parliament (MPs) from 32 countries, representing all regions of the world, showed overwhelming engagement for the UN High-Level Meeting (HLM) on TB and support to the ‘Key Asks from TB Stakeholders and Communities’ during a two-day consultation held in New York on 25-26 April 2018. Day 4 at #UNGA is under way! Indigenous Services Minister Jane Philpott says it’s a stunning fact that many Canadians are unaware of tuberculosis rates in the North. Tuberculosis country profiles are generated automatically based on data reported by countries and which are held in WHO’s global TB database. Countries can update information at any time via WHO’s TB data collection system (or, for countries in the European region, via the ECDC – WHO/Europe Joint Surveillance system). 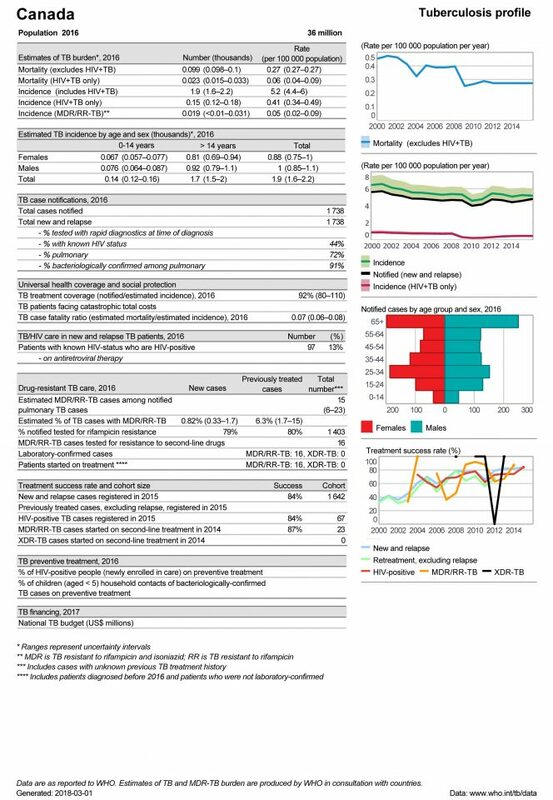 Therefore data in country profiles may differ slightly from the data available at the time Global Tuberculosis Report was written. 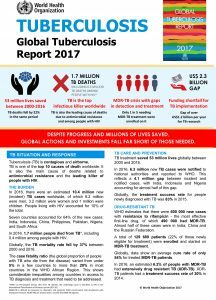 Global efforts to combat tuberculosis (TB) have saved an estimated 53 million lives since 2000 and reduced the TB mortality rate by 37%, according to the “Global TB Report 2017” released by the World Health Organization (WHO) today. Despite these achievements, the latest picture is grim. 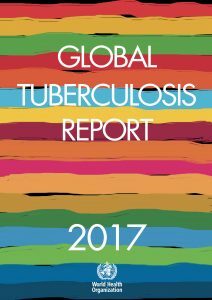 TB remains the top infectious killer in 2016. TB is also the main cause of deaths related to antimicrobial resistance and the leading killer of people with HIV. Progress in most countries is stalling and is not fast enough to reach global targets or close persistent gaps in TB care and prevention. Despite progress and millions of lives saved, global actions and investments fall far short of those needed. – universal health coverage and social protection.